The Foundling Museum in London is crowdfunding for a feminist show that will turn its collection upside down. The museum, which explores the history of the UK’s first children’s charity, the Foundling Hospital, plans to replace the portraits of its male governors with those of the 21 women who first petitioned to establish the building. Although the men’s portraits have hung in the main picture gallery for almost 300 years, there is no mention of the women who were the first to sign the petition in 1735, without whom the institution may never have existed. The exhibition is part of a year-long programme at the museum celebrating the centenary of female suffrage in the UK and the passing of the Representation of the People Act 1918, which gave some women the vote for the first time. 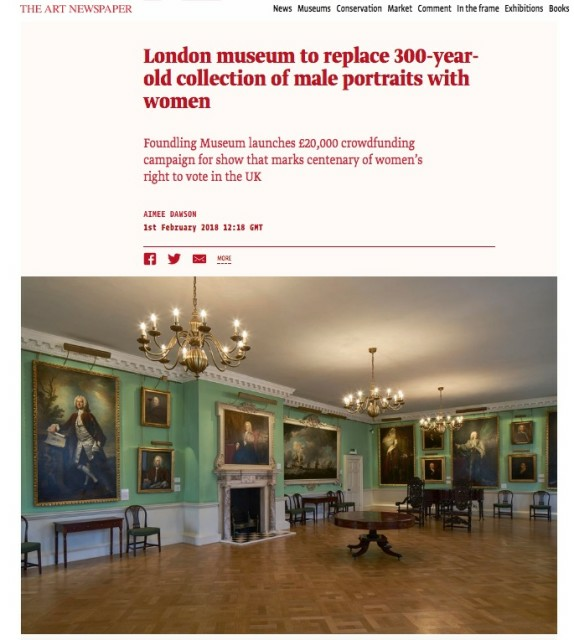 “We want to use this centenary year as an opportunity to say that women being either accidentally or deliberately written out of history has a long legacy and we can tell a 300-year-long story of women who have shaped British society, culture and philanthropy through our collection,” says the museum’s director, Caro Howell. The Ladies of Quality and Distinction (21 September-13 January 2019) aims to bring together the portraits of the women, of which the only existing trace in the museum collection is a facsimile list written by the hospital founder Thomas Coram. The museum’s team has spent a year researching the women and tracking down their images from public and private collections in the UK. Only three images have not been found: one portrait was destroyed in a fire at the 19th-century Clandon Park house in 2015; one exists in a black and white image but cannot be located; and one mysterious portrait remains undiscovered. The museum will display a reproduction of the burnt painting and hang an empty frame for the missing image. The current male portraits, which were painted by some of the most famous artists of the day such as Allan Ramsay, William Hogarth and Joshua Reynolds, will be moved to other parts of the museum building or put into storage and will be reinstalled at the end of the show. The museum’s suffragette centenary programme includes a year-long array of talks, displays and commissions. For the display First Among Equals (until 13 January 2019), around 30 leading female figures in Britain—including the first female director of the Tate , Maria Balshaw, and Eileen Cooper, the first woman to be the keeper of the Royal Academy Schools—have chosen objects from the museum’s collection to highlight with new text panels. The exhibition gallery will explore the lives and work of everyday women who supported the running of the hospital, from the inspectors to the wet nurses. The museum has also commissioned the artist Jodie Carey to create site-specific works (25 May-2 September) inspired by the textile “tokens” that were attached to babies’ clothing by mother’s who had to give them up. The Ladies of Quality and Distinction exhibition will go ahead only if the museum can raise £20,000 through a four-week crowdfunding campaign that launches at midday today (1 February). “We are saying to people that you can genuinely help to put these women back in the frame. The role of these women has been under-recognised and art lovers have an opportunity to change the way that history is told,” Howell says.